The best time to visit Chicago is generally in the spring, late April through June, and again in the fall, September through early November, when temperatures are the most desirable. During these months, you’ll find manageable crowds, a mixture of festivals and events, and more affordable ticket prices and accommodations. Summer is not only the time when you’ll find the highest lodging rates, but also, it’s when the weather is the hottest and crowds are the thickest. Winters in Chicago are notoriously bitter cold, with the average temperature in January dipping below freezing—but, the upside is reasonable lodging and tourist expenses. Whenever you decide to go, taking into account weather and travel rates, use this guide to assist in your vacation planning to Chicago, a city known for its first-rate museums, delectable dining, stunning architecture, and yearlong events and festivals. People from around the globe flock to Chicago to enjoy events and festivals that celebrate culture, music, art, dining, and history, especially during the summer months. If you’re visiting Chicago for one of the organized happenings, plan ahead to secure lodging and tickets where appropriate. If you want to avoid crowds all together, and you’re not interested in joining in on the group merriment, then plan to visit Chicago on a different weekend or at a different time to avoid inflated prices and swarms of people. See below for a more complete list of events, month by month. Chicago also has public holidays that are worth taking into account. Not only do the locals fill the public spaces, but the tourists also take advantage of time off of work to travel during holidays. Chicago summers are often hot and muggy, with average temperatures ranging from the high 50s to the mid 80s, but weather can change considerably with a heat wave and high humidity or strong gusts of wind blowing in from Lake Michigan. Winter is chilly and biting, with a fair amount of snowfall, and average daytime highs in the low 30s to high 40s. Wind chills, however, can cause a dip into the negatives. Unless you’re attending a special event or festival, consider traveling to Chicago in the spring or fall, when it’s the most comfortable outside. Weather, of course, can be unpredictable, so pack a light jacket and an umbrella just in case. Chicago has more than 400 festivals per year, and many of them take place in the summer months, July and August specifically, making this season the peak season. Many activities are free and open to the public and a few are the largest in the world, drawing large gatherings. Weather is generally sunny and hot, and after a long winter, Chicagoans are eager to soak in some vitamin D. Expect higher hotel prices and make sure you book well in advance because properties close to the action fill up quickly. Luckily, Chicago has many indoor goings-on to enjoy during the coldest month of the year. Celebrate all-things baseball at SoxFest, held at Hilton Chicago and sponsored by Beggars Pizza, NBC Sports Chicago and WGN-TV. Dine on belly-warming prix fixe menu delights, from hundreds of participating Chicago restaurants, during Chicago Restaurant Week, organized by Choose Chicago. Winter Brew might be the best thing that happens in Chicago during January as local brewers showcase craft and specialty beers. February is typically just above freezing, with an average low of 17 F—you’ll need to dress warmly if you plan on visiting. If there’s snow, expect delays in traffic. Street parking will also be hard to come by. Warm up with craft ale, listen to live music, and nosh on food truck delights at Chicago Ale Fest, held in February. Chicago Auto Show takes place at McCormick place. Chicago Theatre Week, presented by League of Chicago Theaters, is a great way to see theater for affordable prices. Early March is still biting and cold, making warm-weather apparel vitally necessary. Weather is warmer than in January and February, but not by much, and cold fronts can definitely derail your outdoor plans. Having said all this, March is an exciting time to be in the city due to its large Irish population, creating celebrations and parades. The annual dyeing of the Chicago River for St. Patrick’s Day is a big deal, one that turns out many visitors. A boat crew dumps an orange powder, through a sifter, into the river, turning the water green. The St. Patrick’s Day parade is huge in Chicago, featuring thousands of bands, marchers, horses, floats and people dressed up as leprechauns. Chicagoans love their beer, and Windy City BREWHAHA celebrates that adoration with samples and tastings from craft beer around the city. April experiences a break in the cold, typically, and temperatures are fairly good for enjoying time outside. School is still in session, and summer hasn’t started yet, which means fewer people are in the city during the day. Chicago Comic and Entertainment Expo (C2E2), featuring comic books, cosplay, anime, video games, comedy, wrestling, television, and movies, is the largest pop culture convention the Midwest has to offer. If you feel like you need a laugh, check out the Comedy Improv Festival, highlighting funny people from around the globe. An average high of 70 F, makes May absolutely delightful. Don’t forget a light rain jacket or umbrella, as rain showers can occur. Keep in mind that hotel prices typically begin to rise, heading into the summer months. Maifest Chicago honors German heritage and the start of spring, in Lincoln Square, through food, dancing and music. The annual Chicago Kids and Kites Festival is a free family-friendly event in Lincoln Park that offers crafts and kid-centric activities. Chicago Memorial Day Parade offers Chicagoans and visitors the chance to honor those heroes who’ve served, and are serving, our country. Lake Shore Drive shuts down for Bike the Drive—plan accordingly for travel. There are a number of high profile events this month that take over the city and require forethought when visiting. The weather is sunny and nice, typically—bring sun protection, water and light-weight clothing. Gay Pride Chicago is an enormous event, worth visiting Chicago for—the city lights up with a huge parade, packed bars and restaurants, and full hotels. Take publication transportation if you plan on attending—parking is nearly impossible in the Boys Town neighborhood. Chicago Blues Festival, in Millennium Park, is a fantastic well-attended celebration of music, offered for free. Typically, hot, humid and packed full of tourists and locals, July is a busy month. Expect public transportation to be full, sometimes delayed, and often the best choice given street parking in the city. For the best parking rates, use a parking app to assist with guaranteed spots at cheaper rates. Square Roots Festival is a neighborhood party that is super popular in Chicago—come for food and beer, multiple bands, market vendors, and family-friendly fun. Taste of Chicago, held for free in Grant Park, is the world’s largest food festival. Pitchfork Music Festival enlists big-name acts, over multiple days, creating sun-filled fun for music goers. The city is fiery hot this month—make sure you have sunblock and water and seek out shade where possible if you’re wandering around outside. School is out of session for kids, making museums packed full of families seeking air conditioning and something to do during the day. Most museums, however, offer adult events and happenings—take advantage of those. All along the waterfront, from Fullerton to Oak Street, spectators will be looking up into the sky for the Air and Water Show. See (and hear!) U.S. Air Force Thunderbirds, aerobatic teams, U.S. Army and Navy Parachute Teams, and a variety of combat and military aircraft. This is not the time to have a relaxing beach day—the sand will be chock full of tourists and locals and it will be loud (consider bringing ear plugs if you’re watching the show). Lollapalooza is a large music festival that draws A-listacts, lots of food vendors, and a huge crowd over an entire weekend. The sweet spot for visiting Chicago is in September, when the weather is at its best. Kids are usually back in school in all of the neighborhoods and surrounding suburbs, which means crowds have died down a bit. Jazz enthusiasts will revel in the Chicago Jazz Festival and Hyde Park Jazz Festival. Oktoberfest Chicago, benefitting St. Alphonsus Roman Catholic Church, is a popular three-day annual fall event, which takes place in Chicago’s West Lakeview neighborhood. Beer tastings, brats, pretzels and music are the highlights. Cooler weather makes exploring the city enjoyable. Temperature highs linger in the 60s and 70s, however, expect evenings to require a sweater or jacket as they can dip into the 40s. Toward the end of the month, many outdoor attractions will have limited operating hours or be closed for the season—plan accordingly. Big screen fans will enjoy the Chicago International Film Festival. The Bank of America Chicago Marathon happens this month, closing down many of the streets for the race. Parking is difficult anywhere near the running route. Take publication transportation when possible. 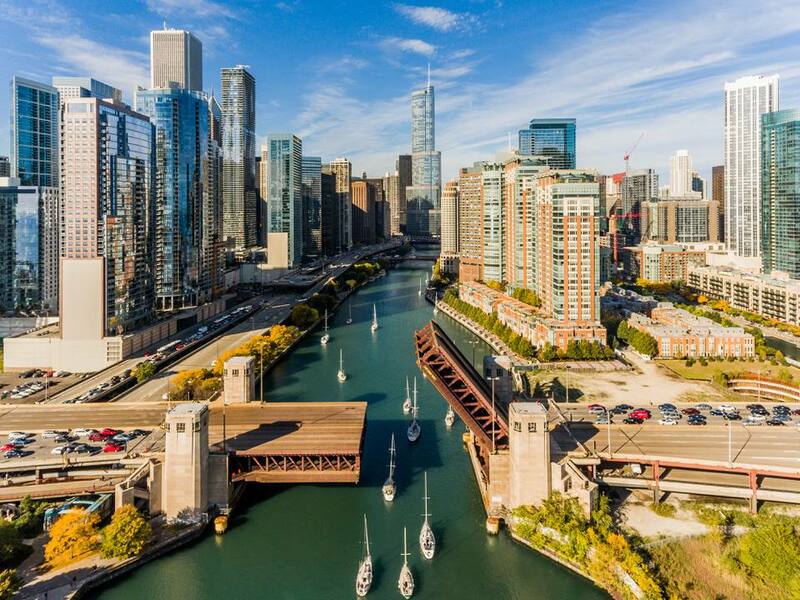 This is the time of year to visit Chicago if you’re looking for a deal—hotels will often have vacancies and offer rooms and packages at discounted rates. If visiting a museum, stay clear of dates around Thanksgiving when schools are on break. The Magnificent Mile Lights Festival happens this month, offering families and visitors many activities. Shopping during this event is often ideal as stores may have discounted prices. Along State Street, between Congress and Randolph, viewers can watch the McDonald’s Thanksgiving Parade (free), featuring large-pieced marching bands, inflatable balloons, and performance acts. Lincoln Park Zoo lights happens during the winter months. You can combine the adventure with the Chicago Trolley and cruise around the city. December, while cold, is a magical time to be in the city. Holiday events and festivals turn the city into a winter wonderland, even though average temperatures are 35 F. Pack warm layers, including a scarf for your face to protect you from the biting wind, and venture outside to enjoy some of these happenings. One of the most beloved Chicago events for the year is the Christkindlmarket, inspired by the German market in Nuremberg. European food, crafts and belly-warming drinks are sold out of little light-filled huts at this outdoor festival, located in Chicago’s loop area. For indoor winter fun, visit the Fifth Third Bank Winter Wonderfest, full of rides, slides, ice skating, and holiday merriment. It’s worth noting that strolling along the streets to see the window displays in Chicago, over the holidays, is a local tradition—especially the Macy’s (formerly Marshall Fields) windows that often have elaborate displays.